908 backers pledged $21,368 to help bring this project to life. We made it! Thank you so much for your awesome support! I hope sincerely, that his game can be an interesting experience, and that some also might benefit from it. … is an adventure, through a world which after a terrible tragedy, is revealed to be as thin as paper. You play a father who accidentally kills his son and then has to keep on living, even though everything crumbles around him. A Song for Viggo contains five chapters, each one revolving around a different one of the difficulties you can experience after losing a child – such as marital problems, depression and suicidal thoughts. In order to portray this as credible as possible I have interviewed several people who have lost their children (even some who share Steve's fate.) It's one of my goals with the game; to bring their stories to you, to make people who may be in this situation – trying to maintain their everyday life in the wake of a disaster – feel that they are not alone. Even after the end, everything continues. Manage everyday chores while trying to deal with the aftermath of your son's passing. For example: To arrange your son's funeral, you first have to call the funeral home, and in order to call them you’ll have to look up their phone number, and so on. But don't forget to feed the cat and buy groceries! In the meantime, your family is falling apart. Explore a city of folded paper, full of details and things to interact with. Make choices that have long- and short term consequences for your life. For example: Your daughter Sarah is a little bit allergic to mayonnaise, but she loves it. In the beginning of the game you will have the choice to give her mayo on a sandwich, just to ease her mind a bit after the tragedy where she lost her brother. Consequence: If you give her mayo on rye, you will trigger an extra event later on, where you will have to spend time at the health centre with her doctor. And your wife Karen will nag you about it several times. If you don’t give her mayo on rye, she’ll be quite upset and refuse to talk to you for several days. The special thing about these choices is that they are invisible. You wont be aware that you are making them, and therefore the game will shape itself after the choices you actually make, not after your answers to some binary “Yes or No?”-questions. I’m doing it out of paper! Every single object in the game – from the houses to the flowers in their garden, from the bookshelves to the books in them – is designed, folded and glued by hand. It's tedious work, it requires massive amounts of time and patience, but by doing it this way I hope to create an atmosphere that you can't find in any other games. 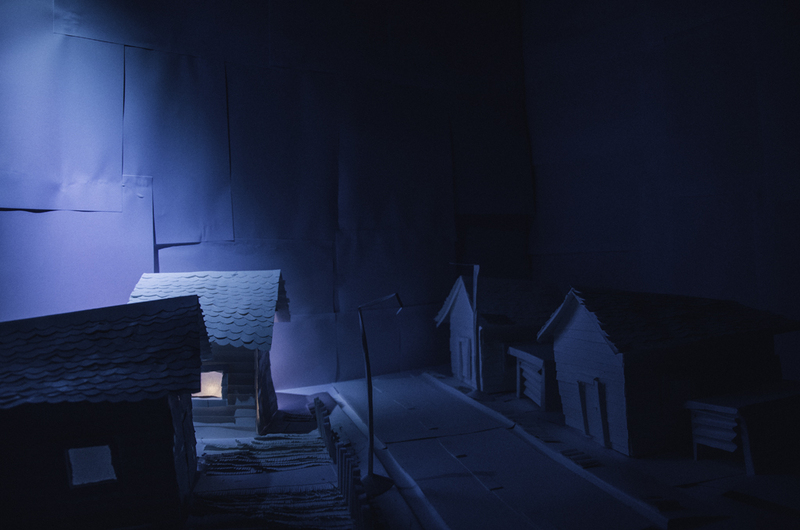 A Song for Viggo will feature about 40 environments plus a whole town to wander around in, and I'm doing it all – the paper art, the music, the programming – myself. That is why I need your donations. I need to support myself while putting down the hours in this work. A Song for Viggo can only be released (on Windows) with your help. Additional ports will be made depending on this funding, reaching certain stretch goals. The only music in the game is the one coming from Karen’s piano as she is mourning her son. Her Yann Tiersen- and Erik Satie-like melodies will sound all over town, and be complemented by ambient sounds recorded from real life. Here are some of the melodies, to give you an idea of what you can expect to hear in the game. The team:Simon Karlsson: Creates the art, writes the script, composes the music and does the programming. A guy who lives for creating. Sits on a tiny chair in a tiny workshop and folds paper into a tiny world, often together with his cat Klara. Fredrik Mårtensson: Marketing, social skills, QA: This amazing guy helps out with the marketing on social medias. Goes over and beyond to make stuff happen. Since he’s working with children with neuropsychiatric disabilities he offers great advice on how the mind works, and thus an excellent resource. Living expenses as I work day and (probably) night with the game. Materials for making the environments – such as paper, glue, aluminium wire, clay, cardboard, scalpels, lighting, batteries (for small light diodes) and so forth. More time for interviews with people who've lost their children or suffered from depression, to do the complexity of these subjects even more justice with the game. Specific armature-skeletons for better animations (if a certain stretch goal is reached). (and thank you Jimmy Beris, for the awesome video). Risks and challenges: The main challenge is to always maintain the integrity of the project and it’s craftsmanship. A Song for Viggo will be created without outside friction and demands. No publisher has any say in this artistic game, hence it’s free from outside control. But of course the project is always open for feedback and value different opinions. Thank you. Many raindrops creates a river. A digital downloadable copy of the game, and a hug (virtual). A digital downloadable copy of the game and the full soundtrack to download. You also get a digital wallpaper and will be mentioned in the credits as special thanks. You get: The short downloadable documentary "Unfolding" revolving around the creation of this project. + all previous rewards! A physical CD-ROM with the soundtrack shipped to you, with a handmade signed papercover + all previous rewards! + an actual physical hand made paper model (randomly chosen) used in the game itself, signed by me + all previous rewards!. One of the following backgrounds (scroll down to section "rewards") printed as a poster 50x70 cm, signed and shipped to you (your choice). Limited edition! You get: An npc (non playable character) with your name (real name) devoted to you in game, who resides/work in the city somewhere + all previous rewards! First of all, I want you to know that you give me a fuzzy feeling in my heart. And then you get all of the rewards above and a session with Simon (talk through phone or Skype, where you can ask any questions, or if you need paper-makin’ advice), + all three printed limited edition signed posters shipped. with me on a piano, on a lonely island in the middle of night. For this donation, shipping the previous rewards are free of charge.